It is easy to see that Hamas' ideology is autocratic, anti-democratic, and anti-Jewish, and does not recognize the existence of the State of Israel. Hamas is listed as a terrorist organization by Canada, the European Union, Israel, Japan, and the United States, and is banned in Jordan, Australia and the United Kingdom. In April 2006, Iran's Islamic regime pledged $50 million to Hamas. Regarding the takeover of the Gaza strip by Hamas, the Palestinian intelligence chief accused Iran of close involvement, saying Tehran funded the Islamic militants and trained hundreds of them. Therefore, it is natural to explore Gaza with Hamas. We try with expected number of ELSs set to 200. 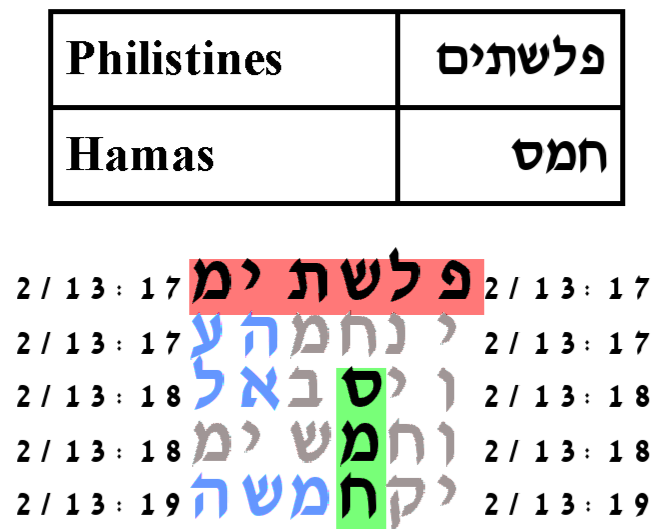 The probability that a text from the ELS random placement text population would have as area compact table as that produced by the Torah text is 14/1,000. Also, it is natural to explore Philistia and Philistines with Hamas. We try with expected number of ELSs set to 100 and to 200. None of the most compact tables produced by the Torah text are statistically signficant. But the configurations are geometrically compact configurations and we show them to document what we have done. The expected number of ELSs is set to 100. The cylinder size is 13 columns. The probability that a text from the ELS random placement text population would produce as small a table as this is 66.5/100. The expected number of ELSs is set to 100. The cylinder size is 183 columns. The probability that a text from the ELS random placement text population would produce as small a table as this is 98.5/100. The expected number of ELSs is set to 200. The cylinder size is 9 columns. The probability that a text from the ELS random placement text population would produce as small a table as this is 38.5/100. The expected number of ELSs is set to 200. The cylinder size is 27 columns. The probability that a text from the ELS random placement text population would produce as small a table as this is 13/100. Hamas receives funding from Palestinian expatriates, and private benefactors in Saudi Arabia and other moderate Arab states and from Iran. Some fundraising and propaganda activities take place in Western Europe and North America. 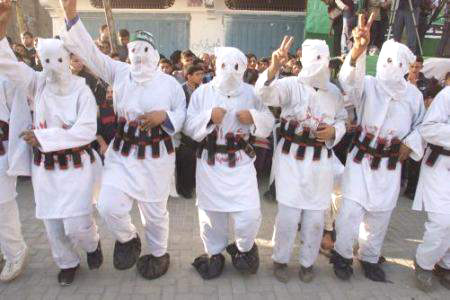 In 2003 US intelligence sources estimated that the militant Palestinian group Hamas had an annual budget of 50 million dollars. Since then, its budget has dramatically increased. In April 2006, Iran's Islamic regime alone pledged $50 million to Hamas. Regarding the takeover of the Gaza strip by Hamas, the Palestinian intelligence chief accused Iran of close involvement, saying Tehran funded the Islamic militants and trained hundreds of them. 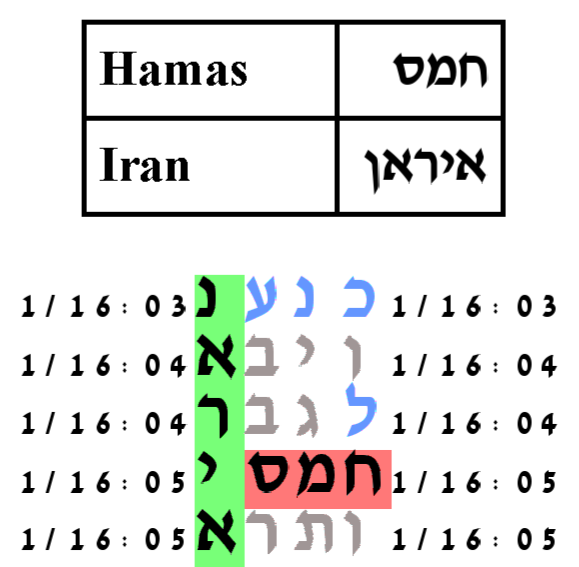 Therefore, we explore key word Hamas and Iran. 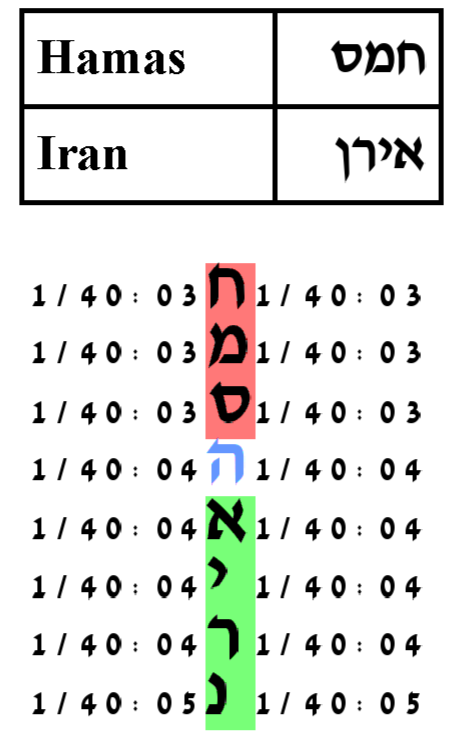 There are two spellings for Iran, אירנ and איראנ. We try both of them. For the spelling, אירנ, we set the expected number of ELSs to 200. 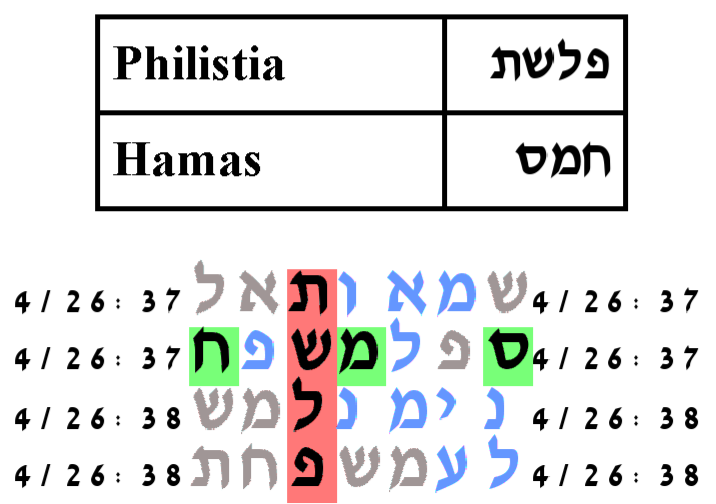 The probability that a text from the ELS random placement text population would produce a table as area compact as that produced by the Torah text is 30.5/1,000. The expected number of ELSs is set to 200. The cylinder size is 27 columns. The probability that a text from the ELS random placement text population would produce as small a table as this is 30.5/1,000. For the spelling איראנ, we set the expected number of ELSs to 50. 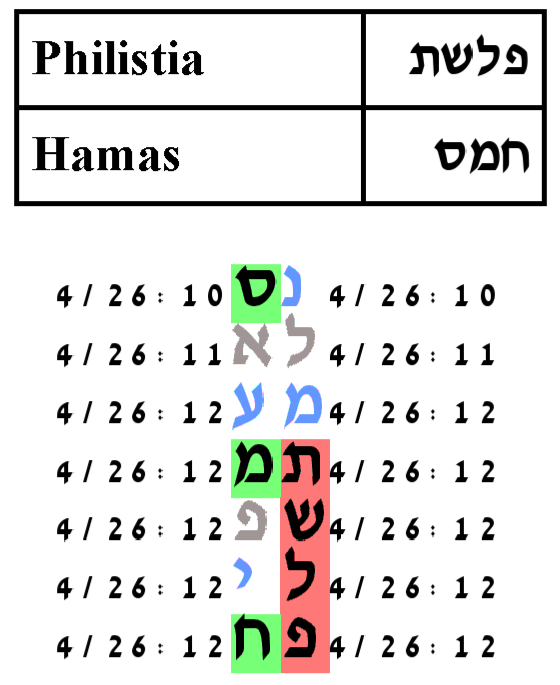 The probability that a text from the ELS random placement text population would produce a table as area compact as that produced by the Torah text is 55/1,000. The expected number of ELSs is set to 50. The cylinder size is 26 columns. The probability that a text from the ELS random placement text population would produce as small a table as this is 55/1,000. 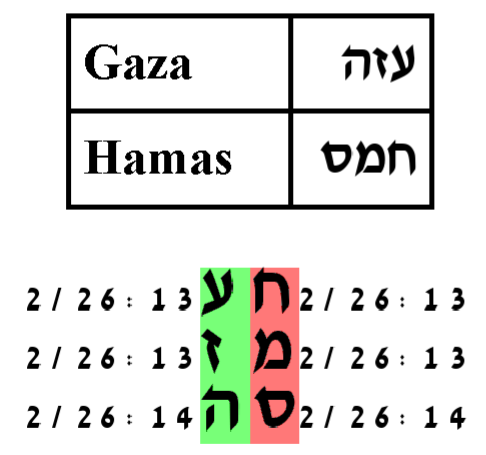 On January 25, 2006, during the Jewish month of Tevet, the month that corresponds to the zodiac sign of Capricorn, there was the Palestinian election. In that election the Hamas party was on the ballet and gained a substantial number of seats in the Palestinian Legislative Council. Before this election, Rabbi Glazerson formed the sentence Hamas will be elected to the Palestinian Authority in Tevet. The table that resulted is highly statistically signficant. 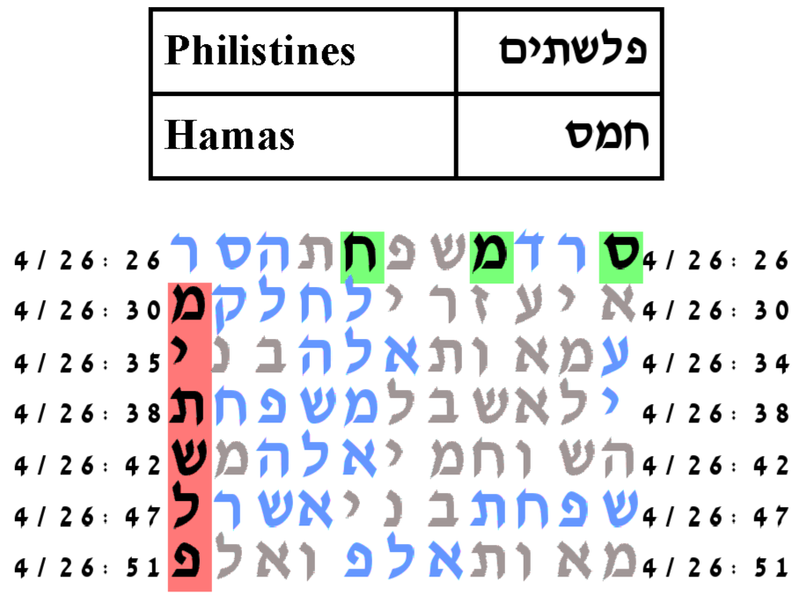 The probability that a text from the ELS random placement text population would have as small an area table as that produced by the Torah text is smaller than 1/100,000. The expected number of ELSs is set to 20. The cylinder size is 3 columns. The probability that a text from the ELS random placement text population would produce as small a table as this is smaller than 1/100,000. There is a relevant development of this table. 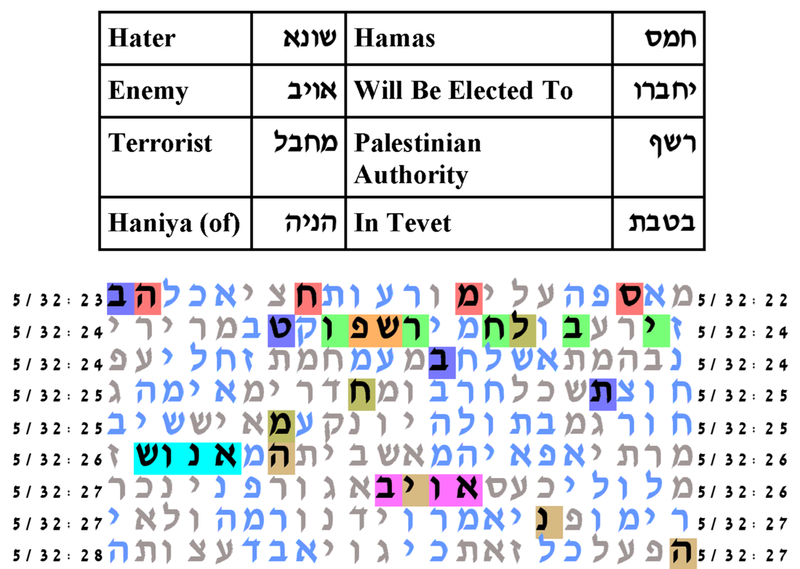 In the table's area are ELSs for the key words: Hater, Enemy, Terrorist, Haniya. The cylinder size is 24 columns. The verses in which this table occurs are also relevant. The verses tell us how the hand of God will work to judge Israel, through Israel's enemies. I shall accumulate evils against them. My arrows shall I use up against them. I shall dispatch against them bloating of famine, battles of flaming demons, cutting down by the noontime demon, and the teeth of beasts with the venom of those that creep on the earth. Israel's enemies will think that they prevailed by their own prowess, independently of God's anger toward Israel, -- but that will be their undoing, because it will cause God to intervene on the side of Israel. I had said, I will scatter them; I will cause their memory to cease from man were it not that the anger of the enemy was pent up, lest his tormenters misinterpret; lest they say, Our hand was raised in triumph and it was not Hashem Who accomplished all this. For they are a nation bereft of counsel, and there is no discernment in them. For the day of their catastrophe is near, and future events are rushing at them.